(1840-1902) Born in Columbus County, North Carolina, while in his senior year at Wake Forest College, he enlisted in the Columbus Guards No. 2, a company which later became a part of the 20th North Carolina Infantry. He was elected first lieutenant of his company, and the following month was promoted to rank of captain. Toon was wounded seven times during the war, and fought with conspicuous gallantry at Seven Pines, in the Seven Seven Days battles, at South Mountain during the bloody Sharpsburg campaign, and at Fredericksburg. He was elected colonel of the 20th North Carolina Regiment on February 26, 1863 and led the regiment during General "Stonewall" Jackson's celebrated flank attack at Chancellorsville, and in the epic battles at Gettysburg, and in the Mine Run campaign of Virginia. After the battles of the Wilderness and Spotsylvania, Toon was promoted to brigadier general to rank from May 31, 1864. He commanded the brigade during General Jubal A. Early's advance on Washington, D.C., and in the battle of the Monocacy. He later fought in the 1864 Shenandoah Valley campaign, and in the Petersburg defenses. On March 25, 1865, during the assault on Fort Stedman, Toon received his final and most severe wound leaving him incapacitated for the remainder of the war. 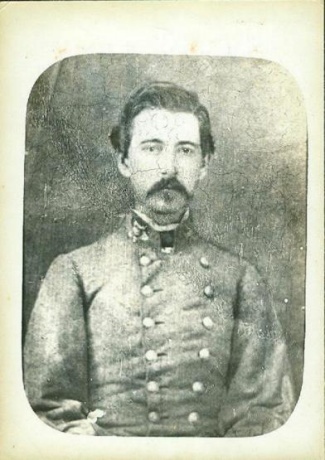 Antique silver print photograph, 2 1/2 x 3 1/2, in Confederate double breasted uniform coat. No imprint. Very fine with some minor age toning and wear. Circa early 1900's. Scarce to find any war time images of Toon.